E570 is a smart-transformer-connected commercial electricity meter suitable for low and medium voltage applications. The meter provides extensive functionality in key areas of metering: power quality, anti-tampering, security, billing data protection and outage support. 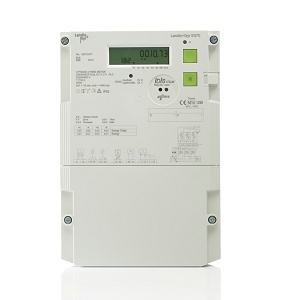 E570 is a smart-transformer-connected electricity meter for low and medium voltage applications in commercial, light industrial and residential use with high electricity demand. Landis+Gyr has developed this meter series as the first generation of IDIS interoperable current transformer (CT) and current and voltage transformer (CT/VT) connected meters with powerful and future-proof AMI functionality. The E570 is available either with PLC or P2P communication technology. For PLC communicating devices, Landis+Gyr offers PLAN+ and G3-PLC technologies and for P2P (also known as mobile or cellular group), 2G/GPRS, 2G/4G and a standalone option. Cellular meters support E57C form factor modularity and will also support other communication technologies in the future. Exchangeable communication modules help the customers stay flexible, in sync with latest technology trends and benefits they bring. Meters support plug-and-play principle and can be easily exchanged in the field. E570 is tailored to specific utilities’ needs, such as powerful automated meter reading, power quality measurement, low and medium voltage transformer monitoring as well as load and demand control. The extensive registration concept combined with large storage capacity produces a comprehensive collection of smart data that delivers actionable insights for energy companies. The multi-energy gateway functionality for gas, heat and water meter reading further enhances the outstanding capabilities of E570 for centralized smart energy management. Interoperability is crucial for utilities to flexibly extend and adapt their metering infrastructure in compliance with their evolving strategy, while maintaining freedom of choice for sustainable procurement. The E570 has been tested and certified according to IDIS (Interoperable Device Interface Specifications) package II and conforms to open international interoperability standards, ensuring seamless integration into a utility business system. In addition, E570 complies with the HLS specifications of IDIS package II for data communication, which makes it one of the first interoperable devices to support unauthorized access protection, data integrity and consumer data privacy according to the IEC 62056 standards. Furthermore, the meter adheres to the latest Environmental (RoHS) and Electrical Safety (IEC62052-31) policies.